This Starter Box contains everything you need to start playing Call of Cthulhu—the tabletop roleplaying game of mystery and horror. Players take on the role of investigators of mysteries, uncovering dark secrets, encountering strange monsters, and thwarting sinister cults. Together, you and your friends create and develop a story in which each of your characters plays a leading role, which could be foiling some dastardly plot or stopping horrors from beyond space and time! Roleplaying gaming is a social pastime. Everyone works together in a team, each playing an investigator character. One player runs the game—the Keeper of Arcane Lore—who referees the game and presents the story and adventure plots to the other players. Think of it a bit like acting in a drama, but where there isn’t a script. Dice and the rules of the game determine the success or failure for your character’s actions—all while you are propelled into dramatic and nerve-tingling situations! The emphasis is on having fun. 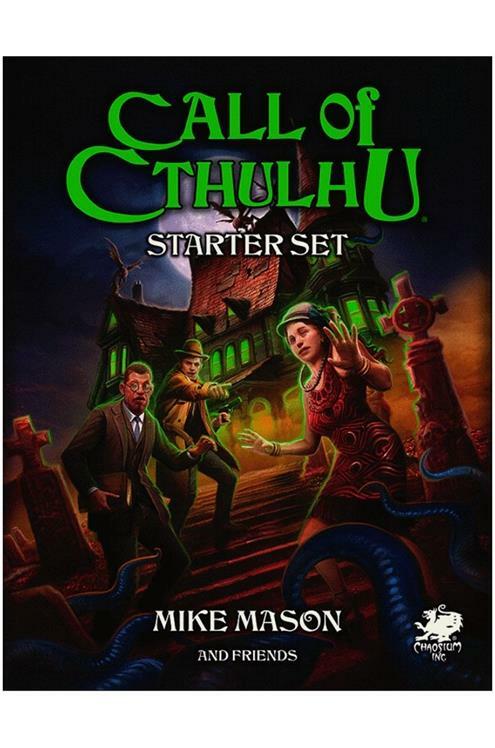 Contents: Book 1: Introduction and Alone Against The Flames—a solo introductory adventure, teaching you the basics of Call of Cthulhu as you play through a mystery. Book 2: Call of Cthulhu Starter Rules—the essential rules, everything needed for starting play. Book 3: Adventures—three starter adventures for your players to explore. Ready to Play Investigators—five ready to play game characters. Blank Investigator Sheets—ready for creating your own investigators. Roleplaying Dice – a set of six polyhedral dice for use in the game. Player Handout – a set of ready to use props. 4 classic adventures.